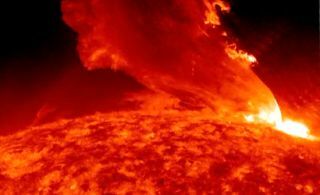 Radiation hazards are likely to increase for air travelers and spacefarers in coming years due to changes in solar activity, researchers say. Cosmic rays from deep space and high-energy particles from the sun can be hazardous to astronauts and also can expose airline crews and passengers to radiation, as well as damage spacecraft, aircraft and satellites. Solar magnetic fields protect Earth by repelling incoming galactic cosmic rays, but the period of high solar magnetic activity known as the grand solar maximum that persisted throughout the Space Age now appears to be coming to an end, and solar particle levels might start rising at the same time. When powerful sunstorms are aimed directly at Earth, they can pose a serious threat to astronauts in orbiting spacecraft, damage satellites, interfere with communications systems and impact power plants and other infrastructure on the surface. Mild space weather events — such as yesterday's (Sept. 26) geomagnetic storm, sparked by a weekend solar flare — can also supercharge Earth's northern lights displays. Atoms can be transmuted from one element to another by the cosmic rays and solar particles that slam into them, events that scientists can detect in these ice samples. Researchers supplemented these ancient records with present-day data from a global network of neutron monitoring stations. Based on these past records, the researchers predicted future variations in galactic cosmic ray levels, the near-Earth interplanetary magnetic field, sunspot number and large solar storms. They found the risk of hazardous space weather is likely to rise noticeably over the next century from the level in recent decades. One should not necessarily put off air travel, said study co-author Michael Lockwood at the University of Reading in England. "However, it is good to be aware that one is exposed to more hazardous particles, particularly on trans-polar flights," Lockwood told SPACE.com. "For really frequent, lifelong fliers, it might become wise to be like workers in the radiation industry and have more-frequent and more in-depth health checks. Also, to reduce exposure for passengers and crew to higher doses during solar events, flights may be diverted to lower latitudes and altitudes, with delay and cost implications — those extra costs will be reflected in ticket prices, of course." The scientists detailed their findings online Aug. 19 in the journal Geophysical Research Letters.